Tree 6–25 m. high, altogether glabrous. Bark reticulate or scaly, grey or brown. Leaves:petiole 4–9 cm. long; rhachis 2–18 cm. long; pinnae 2–5(–6) pairs, opposite or subopposite; leaflets 5–9(–10) on each side of a pinna, elliptic to obovate-elliptic, usually emarginate at apex, 1.2–3 cm. long, 0.7–1.9 cm. wide, on petiolules 1.5–3 mm. long. Racemes (3–)6–17 cm. long, on peduncles 1.5–4.5 cm. long. Flowers yellow, on pedicels 1.5–3.5 (–5) mm. long. Petals 3–4.75 mm. long, 0.8–1.5 mm. wide. Pods 9–17(–19) cm. long, 2–3.3 cm. wide, brown, glossy, blunt or ± pointed at apex. Seeds 10–13 mm. long, 7–8 mm. wide, 4–5 mm. thick. Little evidence as far as our area is concerned, but probably in deciduous woodland or wooded grassland especially on sandy soil; from probably near sea-level to 1370 m.
Dense spike-like racemes of yellowish-flowers. Tree 6-15(25) m. high, altogether glabrous; bark reticulate or scaly, grey or brown or blackish. Leaves: petiole 4-9 cm. long; rhachis 2-18 cm. long; pinnae 2-5(6) pairs, opposite or subopposite; leaflets 5-9(10) on each side of a pinna, 1·2-3 x 0·7-1·9 cm., elliptic to obovate-elliptic, usually emarginate at the apex, on petiolules 1·5-3 mm. long. Racemes (3)6-18 cm. long, on peduncles 1-4·5 cm. long. Flowers white except for yellow anthers, fading to yellow, on pedicels 1·5-3·5(5) mm. long. Petals 3-4·75 x 0·8-1·5 mm. Pods 8-17(20) x 2-3·5 cm., brown, glossy, blunt or ± pointed at the apex. Seeds 10-13 x 7-8 x 4-5 mm. Tetrapleura obtusangula Welw. ex Oliv. in Bol. Soc. Brot. 29: 42 (1955). Keay in Flora of West Tropical Africa, ed. 2, 1: 492 (1958). Torre in Consp. Fl. Angol. 2: 264 (1956). Exell & Torre in Bol. Soc. Brot., ser. 2, 29: 42 (1955). Brenan, J. P. M. (1970). 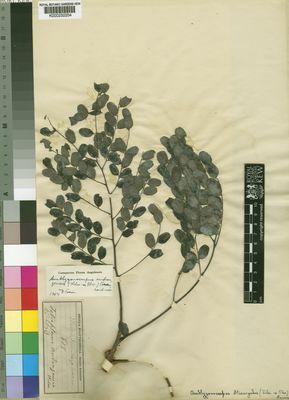 Mimosoideae. 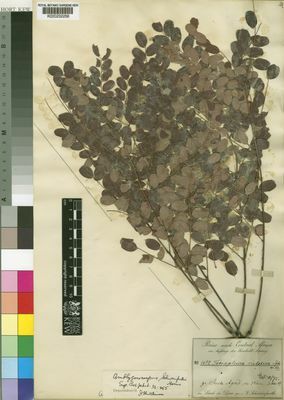 In: Flora Zambeziaca Vol. 3(1). Brenan, JPM et al. Eggeling, W. J. & Dale, I. R. (1952). The Indigenous Trees of the Uganda Protectorate.